This typical Ibiza finca is perfect for big groups of 12 adults and 2 kids. This finca is about 500 years old and fully renovated in 2007. With lots of restaurants, villages and beaches like s'Argamassa, Cala Martina and Cala Nova close by this is a great location! About 5 minutes away you will find the popular market Las Dalias. Are you looking for a real Ibiza experience? Can Cas is the house to rent! This finca has lots of surrounded nature where you can totally relax. When you arrive at Can Cas you will first pass a big playground (52m by 22m) where you can easily enjoy some sport activities such as basketball, football and tennis. There is a table tennis table available too. When you continue you will arrive at the salt water pool (11m by 5,5m). 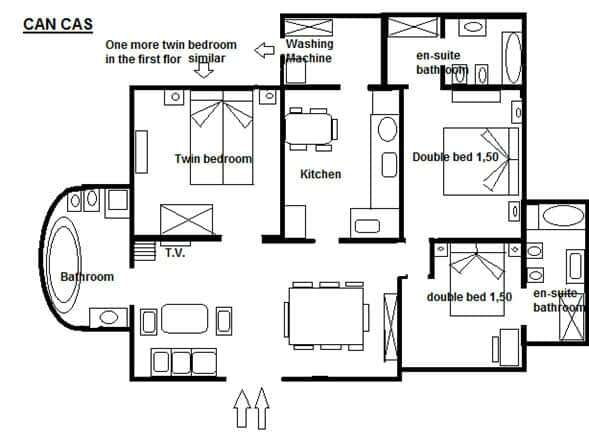 The house contains of 2 houses; the main house is perfect for 8 persons, the second house for 4 persons and 2 children. The main house a fully equipped kitchen with next to it the store and laundry room. It has 4 bedrooms, one of them is located on the second floor. 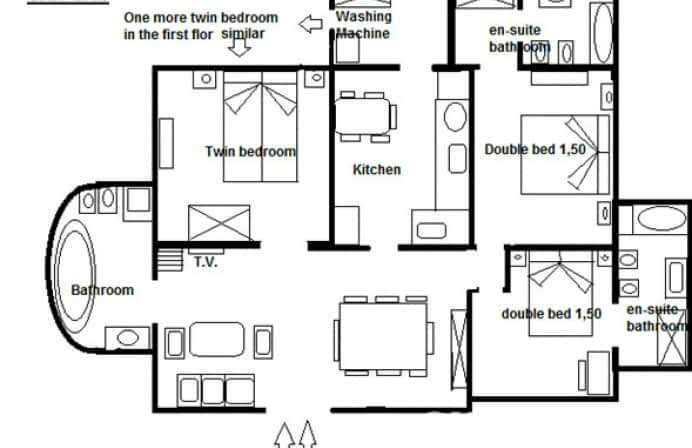 2 Of the 4 bedrooms have an en- suite bathroom and double beds. The other 2 have single beds and share a bathroom with bathtub on the ground floor. Outside there is a cosy dining area with a big table where you can enjoy a nice BBQ or just chilling! In the second house there is a living room with an open kitchen, a bit smaller then the main house but still very functional. 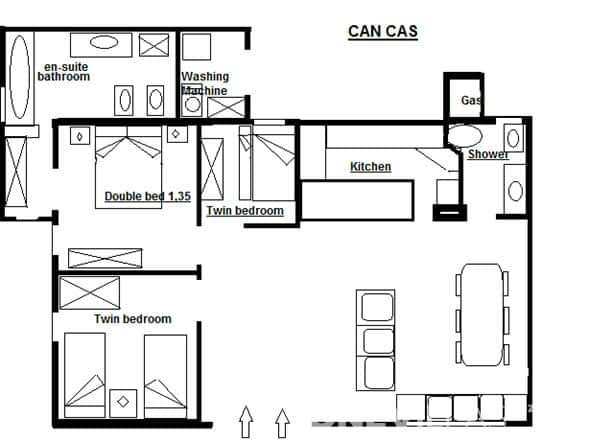 There are 3 bedrooms, one of them has a roll out bed which is perfect for kids. The second bedroom has 2 single beds. 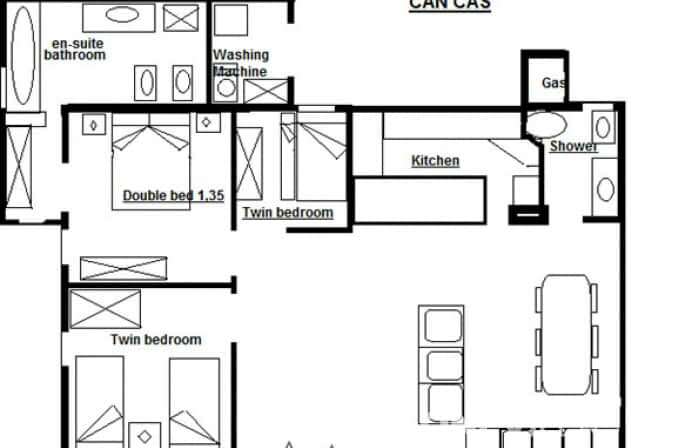 The master bedroom has a double bed 135x190cm and en- suite bathroom. Almost all rooms have an portable fan, but due to the think walls it stays fresh inside all the time. Lovely holiday for the 2nd time in this house. Everything was as expected and was great arranged. Large and spacious house with all the facilities you could wish for. The spacious court, the large pool, plenty of covers for the pool beds, the blinds on the windows of the bedrooms, good wifi signal everywhere, a washing machine, plenty of utensils, pots and pans, the very hospitable owner, 12 cold beers on arrival; In short, a lovely villa. A great house for large groups, enjoyed it! Very cozy house - clean and calm environment - perfect for two families: each house - many fruit trees and beautiful garden. Big swimming pool. Very large sports field for children (ping pong, tennis, soccer and basketball). All material contained tennis rocket, balls to luchtmatrass. Children have great amusement. Fans in all rooms. Kitchen is well furnished, complete kitchen equipment. Owner is very friendly - has brought immediately what we needed: Nesperro machine, BBQ equipment ... House is well located. 5 minutes from downtown Santa Eulalia and 30 minutes from Ibiza town. Highly recommended for quiet and family vacations and yet close to restaurants and beaches. WE really enjoyed it. Alarm system available. Enough sun beds by the pool. The finca was beyond our expectations! Particularly nice manager / owner. Superbly located in the beautiful part of Ibiza (near beautiful lake 'hippie' (ie relaxing) beaches All the space around the farm and a lovely swimming pool is highly recommended..! Thoroughly enjoyed the house and our stay in Ibiza. House beautifully located and all facilities were top notch. Fully met our expectations and the presented photos and notes.